The Brønsted-Lowry definition of acids and bases uses hydrogen. Gilbert Lewis proposed a definition based on electrons. A Lewis acid is an electron-pair acceptor and a Lewis base an electron-pair donor. Using this definition, metal ions H+ are acids and ligands, water, ammonia and non-metal ions are bases. The Lewis base nature of oxygen and nitrogen is important in many organic mechanisms. Take a look at the reaction below. 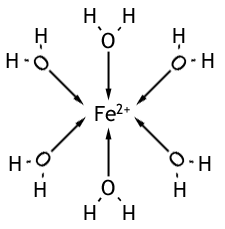 In this reaction, water is a base (lone pair on the O) and H+ the acid. When a transition metal is dissolved in water (a metal salt, for example, since metal by itself has too strong bonding to dissolve) it forms a metal-aqua ion where the water acts as a ligand to form a complex. For example, if FeSO4 (iron (II) sulphate) is dissolved in water the following forms in a green solution. The transition metal can be generalised to either M2+ (where M could be Fe, Co, Cu) or M3+ (where M could be Al, V, Cr or Fe; say). And they form the complexes [M(H2O)6]2+ and [M(H2O)6]3+. The bonding between water and the metal is so strong that when it is evaporated a complex is formed in the solid form. Again using the example of iron (II) sulphate - it can form the complex FeSO4.7H2O (s). When a metal-aqua ion is placed in water the following equilibria are set up. Note that since the OH- is negatively charged, the overall charge of the complex it is in drops. This is called a hydrolysis reaction since one of the H2 ligands is split and an H+ removed. This means an acidic solution is formed. The solution is weakly acidic and the M2+ very weakly acidic. The acidity of the metal-aqua complexes is affected by the chage of the and size of the metal; together these make the charge density. A small, higher charged ion like Al3+ has a greater polarising power so makes more acidic solutions. It does this because the ions can hold onto the water more strongly - which weakens the O-H bond. When carbonates are added to M2+ they form metal carbonate - MCO3 - precipitates. Metal (III) however are stronger acids so react differently. A metal hydroxide precipitate is formed and an effervescence of carbon dioxide. Because of this, metal (III) carbonates cannot be prepared so M2(CO3)3 doesn't exist. The hydrolytic reactions can also be reversed by using strong acids, so the metal hydroxides can dissolve in acid; also, in excess OH- a soluble anionic complex is formed. The ability to dissolve in acids and bases make metal hydroxides amphoteric. Take the examples of aluminium (III) and chromium (III) hydroxide. Furthermore, chromate (VI) ions react with acid to form dichromate (VI) ions, this reaction is reversed when reacted with alkaline solution. The colour change is from a yellow to orange solution.